Cyclone Pam—Category 5—has hammered Vanuatu. An estimated 260,000 people were in the disaster zone when the cyclone struck on Friday and continued over the islands on Saturday. 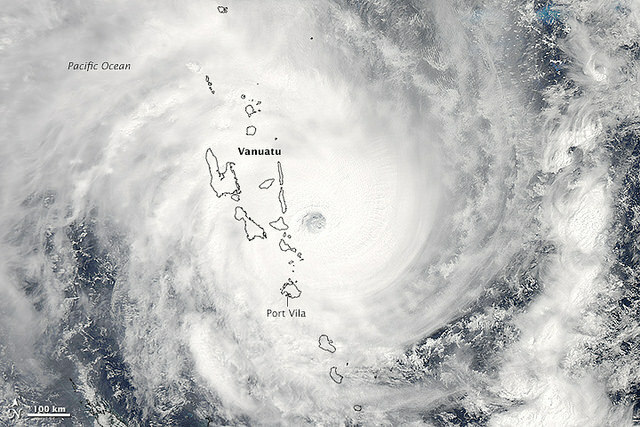 The cyclone is one of the biggest to traverse the region and the biggest experienced in Vanuatu since records began. Other Pacific countries, including New Caledonia and Tuvalu, have also been affected. At least 6 people have been confirmed dead in Port Vila, with concerns for many more deaths in the north of the country. Film footage of the destruction from Vila can be seen here . The enormity of this event yet again underscores the fact that the Asia-Pacific is the most natural-disaster-prone region in the world, with the Island states in particular extremely vulnerable to cyclones, floods and earthquakes. According to World Bank figures, extreme natural events have affected more than 9.2 million people in the Pacific since 1950 and caused damage worth about US$ 3.2 billion . Aid organisations, governments, donors and local communities are already involved in the emergency response to assist Vanuatu, working in collaboration with its National Disaster Management Office. And so too is Defence: two RAAF C-17A Globemaster III aircraft have transported an ADF reconnaissance team to Port Villa, along with DFAT personnel and NGOs under Operation PACIFIC ASSIST 2015 . The aircraft will deliver critical humanitarian aid and disaster relief supplies , including hygiene kits, blankets, sleeping mats, shelter kits, insect nets, water storage buckets and water purification tablets. Two AP-3C Orion maritime patrol aircraft are operating from Honiara, providing post-disaster imagery reconnaissance flights for the governments of Vanuatu and Solomon Islands. And the ADF is standing ready to respond to additional requests for assistance. A C-130J Hercules will transport Defence emergency evaluation personnel and DFAT officials to Port Villa to gather information that’ll guide the type and priority  of our aid to Vanuatu. The Defence contribution will expand as the situation in Vanuatu becomes clearer, although the immediate priority is moving life-saving aid and assisting local officials understand what specialist capabilities are needed. It’s hardly surprising that in our Pacific backyard, the ADF looks set to play a big role post Cyclone Pam; it’s got the necessary capabilities to offer logistical support, medical care, damage assessment, engineering, supplies, communications and imagery. In short, it’s well-placed to provide life-sustaining assistance quickly. The ADF’s got a solid track record  of responding to regional disasters, from the 2004 Southeast Asian earthquake and tsunami to the 2011 Japan earthquake and tsunami. While most of these types of missions involve only a few ADF members and assets for relatively short periods, the benefits of deploying the ADF extend well beyond the immediate benefits of rescue and disaster relief. Our military assets build confidence with neighbours through our disaster relief activities. Defence disaster diplomacy might be a good way of looking at it. Many of the possible features here are set out in a recent ASPI paper  on expanding Australia-Japan disaster management cooperation. (See pp.31-34.) As disaster trends intensify, so too will demands for coordinated, multilateral regional disaster response operations. So we should, for example, continue to support strengthening inclusive disaster-related exercises in the Pacific and work on regional accreditation systems for foreign medical teams. Due to Australia’s emergency resources, it’ll be expected that we’ll continue to take on a leadership role, leveraging our defence assets in the Pacific when those states are overwhelmed by a natural crisis. From an ethical and political standpoint, as the most capable country in the Pacific Island region able to provide swift comfort when disaster hits, we’re not just going to stand idly by. This isn’t just a matter of being a regional Good Samaritan; it’s about building trust, stability, resilience and confidence with our neighbours. That’s why these missions should be seen as principal task of the ADF and reflected as such in strategic guidance. One piece of good news out of this recent disaster is that Vanuatu may be able to bounce back relatively quickly: it’s part of the recent extension of a regional catastrophic risk insurance pilot scheme  that’ll enable relatively quick access to post-disaster financing through an insurance pay-out. As I’ve noted  previously, Island governments have in the past struggled to arrange national insurance coverage of the magnitude that natural disasters can require. Anthony Bergin  is deputy director of ASPI. Image courtesy of Flickr user Gunner Ries .